What are Bad Sectors and How to Fix Bad Sectors in Hard Drives? Home > Storage Device > What are Bad Sectors and How to Fix Bad Sectors in Hard Drives? Summary: This blog offers a detailed-oriented tutorial about The Worst Enemy for Your Digital Data— Hard Drive Bad Sectors. With hands on this tutorial, you can clear your apprehensions about Bad Sectors in Hard Drive. It speaks about its causes, types, effects, and solution. Read on to know more. In this digitised environment, Hard Drive Damage, Data Loss, and Data Recovery are some of the keywords. Several reasons back the loss or damage circumstance. Among those extensive options, Bad Sectors is also one of the reasons for Hard Drive Failure. Bad Sectors in Hard drives is one of the most common forms of Hard Drive Damage. The significant impact of these sectors is the creation of a data loss scenario. However, the best thing is that there are solutions to cater to Data Loss. Hence, take a look at the Bad Sectors in more detail. What is the Hard Drive Sector? Hard Drive sectors are small sections of the magnetic media surface. They hold tiny information chunks and represent how data is stored on the Hard Drives. In Older versions, there are 512 bytes, while in the Modern version, there are 4096 Bytes. Usually, it saves data in fragments form. How Do These Sectors Go Bad? In general, the Hard Drive Sectors goes bad due to wear and tear. Adding more, other common cases include manufacturer defects, direct physical damage, and some software errors. About Bad Sectors in Hard Drive? When tiny clusters of defective storage space or a sector that takes a longer time to access is a Bad sector. We can also say that it is a sector that is no longer readable or writable and has been compromised. It is a potential source of Hard Drive damage. In the case of bad sectors, a user cannot access data fragment properly. These Bad sectors are physically damaged storage cluster on the Hard Drive and turn storage cluster in the form of a fixed magnetic state. All types of read and write operations execution get inhibited. Neither OS nor disk controller can access them. You can prevent these Bad sectors but cannot repair them. These Bad sectors are a storage cluster that does not appear to function correctly. For both OS and Disk Controller software, these sectors are inaccessible. These sectors occur when the sector found Error Correction Code does not go in sync with the Sector content. In this case, mainly hard drive formatting wears out. You can repair these bad sectors by overwriting zeros on everything on the disk. Inevitably, after a particular span of the time, over-ageing is bad for every electronic device. The reason being, after a stipulated time frame, these devices continue to fail and eventually degrades. Similarly with the hard drive case; it starts failing so its parts like platters. Another standard issue. Whether you are using the new or old Hard Drive, it will fail or get damaged if there is overheating. File System Errors is defined as one of the major Bad Sectors cause. The impact of this cause is that it not only makes it inaccessible but it makes it permanently damaged and non-recoverable. This is the most common and simple approach. The reason being, multiple copies helps you to ensure protection against hard drive’s data running. Therefore, if one copy fails, the other can be used. An approach in which drive files and folders are thoroughly scanned as well as searched to identify corrupt files and inconsistencies. And the benefit of this option is to clean up basic file problems that cause data issues. Further, if the error still keeps occurring while performing the Error Checking, this indicates proliferating bad sectors or a dying drive. In this approach, each disk sector is thoroughly examined for bad sectors identification as well as marking. With hands on this option, bad sectors areas can easily be marked off-limits to the file system. Adding more, spare sectors can assign to replace them. Though a bit lengthy process, however, this is the only non-destructive option for bad sectors mapping out. It is a Self-Monitoring, Analysis and Reporting Technology. It queries the drive’s internal SMART information for the current status. This indicates the physical well-being of the drive at the present scenario. This is yet another effective method. 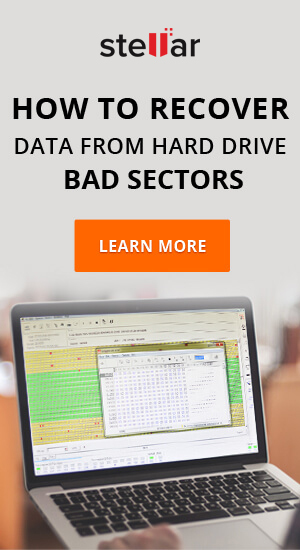 In this, we scan hard drives for bad sectors. It repairs the soft bad sectors and marks hard bad sectors as bad. Inevitably, all these work pretty well in a Logical Failure scenario. However, what if the Hard Disk is Physically Damage? To combat it, the Data Recovery Service is a perfect option. If a recommendation of the best Data Recovery Service Provider is to be given, then go for Stellar Data Recovery Service Provider. Furthermore, It is tried, tested, and approved a solution. How to Prevent Bad Sectors? Bad Sectors are just like others, another common reason for the Hard Drive Failure. One can encounter it anytime. Therefore, one should always back up their data on a regular basis to avoid such conditions.